I tested the branch out on my Ubuntu 16.10 box. I tested various things including painting with different engines, different sizes, and instant preview. It overall seemed to work very well and very fast! Great job! Use fuzzy stroke with the hue or value options in the pixel brush: it'll seem as if it is working on a few dabs before generating a new random value. Okay, reproduced. I will fix it now. set outline to none and fill color to a color. paint and observe it doesn't update the canvas. paint and observe it does fill the canvas. 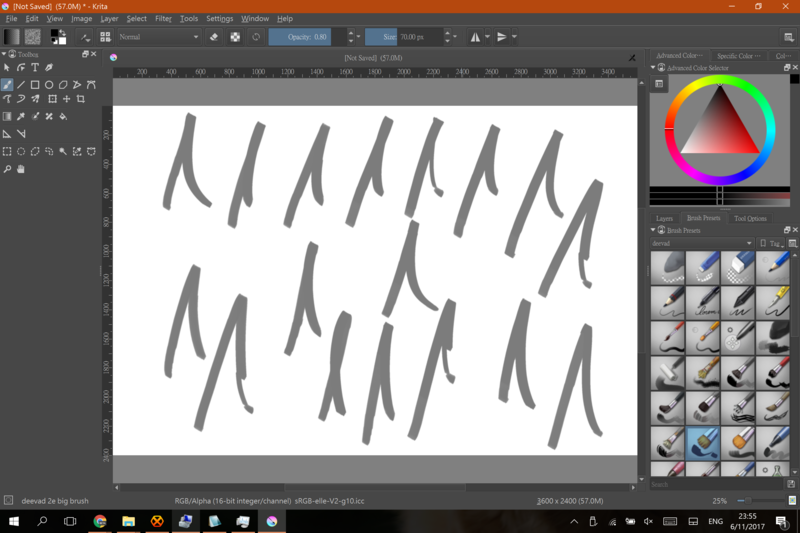 I noticed on linux the pixel brushes seem to stop working when the pixel size gets under 1 or 2 pixels. If it is larger than that they are ok. The built-in presets PixelArt_Dithering, PixelArt_Square and PixelArt_Round seems to always crash for me after a few strokes. They also stop drawing on the canvas usually after I drew half a stroke..
Pixel1 doesn't draw anything, but if I draw with PixelArt_Square after having tried to draw with Pixel1, I can sometimes see traces around the new stroke that looks like what the Pixel1 preset should've drawn. rempt added a commit: R37:5702250277ee: Fix FuzzyStroke, Distance, Time and Fade sensors when used in multithreaded…. I experiencing crashes with textured brushes. Noticed on brush like here https://phabricator.kde.org/T7052 but it happens with other too. It need a couple minutes of painting to get the crush, simply brushes seems to be more stable but I got crashes with them too. Even just hard round with texture can crash. Drawing outside the main canvas in wrap around mode is broken with the pixel engine, getting disconnected line segments. dkazakov added a commit: R37:04e0f8fa8f1f: Make the lower limit of the brush update period shorter. When using the "deevad 2c flat" brush, it doesn't seem to be reducing the update rate for a faster stroke?